Alright already, so what is this 85 year old woman, who on too many occasions still thinks she is 55, trying to prove??? For indeed, mid-journey, as I packed and unpacked on yet another leg of the trip, and stretched my back hoping to remove the cricks and creaks from my spine, ordered yet another wake-up call and taxi to the airport, that question was a constant. I dared not look in the mirror for the answer. I was sure to discover I had morphed into a female facsimile of The Ancient Mariner. How did what was supposed to be two weeks and a couple days turn into almost a month? Well, I am glad you asked. I’d like to know how that happened, too. The first invitation came from my good friends in the Gers (an area between Bordeaux and Toulouse), an area of ducks, foi gras, armanac, truffles, and brilliant wines. The original plan was for me to stay 2 weeks and then go onto London to see some other friends and then home. It would have been 2 weeks and 3 days in London. Doable! Dublin??? I’ve never been to Dublin. I always wanted to go to Dublin… see the Abbey Theatre… pretend to be Irish for a couple of days. Yes! Let’s go to Dublin. So a two-week trip suddenly got to be 3 weeks and a couple of days. Now, I finally healed a fractured third lumbar of my spine. I knew extending my trip would give me some bumps. I thought if I was careful, I could do it. So I went for it. I flew to Paris and then from Paris to Toulouse and my adorable friend Mary picked me up. My friends have a beautiful house but wherever I travel if I can I make it a policy to stay at a hotel… I live alone and over the oh, so many years, I have, what shall I say,… developed, alone habits and eccentricities. Just very personal preferences nothing illegal… although these days, that might be hard to prove. So I had previously stayed in the Hotel Guilhon in this medieval walled village of Lectoure. Thierry and Marc, the owners and dear friends from a previous stay, who greeted and treated me like their long lost Brooklyn relative. Oh, yes, born and bred in Brooklyn, and even in the Gers they heard of the place. Their hotel is a 17th century ancient that has been brilliantly restored… only 5 rooms but each room is a decorator slice of heaven. They serve a lovely continental breakfast with fresh fruits and croissants and brioches, boiled eggs if chosen… and for special guests from Brooklyn, Thierry would make dinner. Simple, elegant French cooking at its best. And last year I was introduced to the beautiful, inside and out, person, Pascale, who drove me everywhere and introduced me to second hand and antique shopping. Nothing like being in a place that goes back a few thousand years to discover the culture of the place you are visiting. And since Pascale had her own shop she really knew what she was talking about. Pascale, Thierry, Marc and moi… The Four Musketeers! Or, as I called them my very special French Mafia! So what could be wrong?? Nothing! Absolutely nothing! Except in the middle of the second week, my aching back got a little more aching… too long away from the body workers that guard my spine. Grid your loins… that’s easy for you to say! However, at the appointed time, I flew to London… and of course, the new way for me is the wheelchair. Oh, my friends, I shall never understand anyone who can choose a wheelchair not choosing one. Afraid to admit how the apparatus ages you…. not on your life… literally as well as figuratively. Think of what you would look like after rolling your luggage through a terminal that makes a football stadium look like a puddle. No! Thank you. Give me my wheelchair and let the vanities be damned. London was great… back to the Royal Automobile Club around the corner from Buckingham Palace. 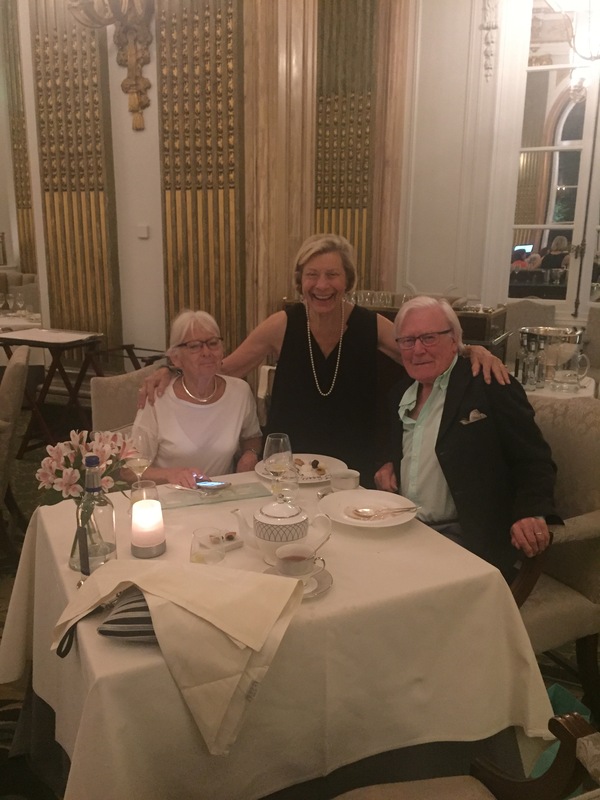 (I was terribly sorry to miss tea with the Queen, but I only had 4 days) The club is convenient and the concierges Geoffrey and Martin, extraordinary helpers, especially my Irish friend Martin with his beautiful brogue who outlined my entire program for Dublin. 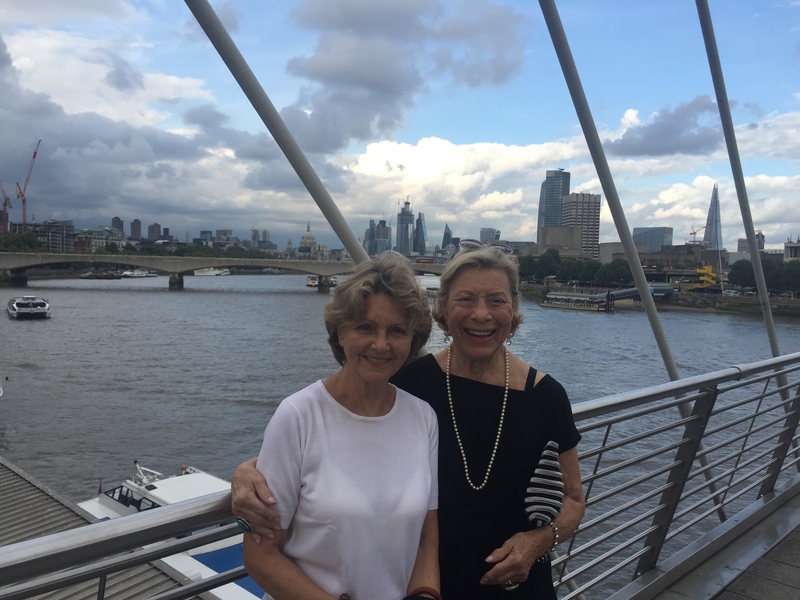 But while in London, it was the meeting up with friends… you know the kind of friends I am talking about, the friends that belong to a very special club… THE WE’RE STILL HERE CLUB! As I look through my little phone book…the crossing out of names is on every page. Of course, I don’t need a reminder of my mortality… truly at this age it circles my head like a flea or fly or on certain days a buzzing mosquito or bee. Shoo it away, my friends, just shoo those suckers away!!!! There was a very special event with one of my friends. Sculptor extraordinaire, Helaine Blumenfeld, had a special exhibit at the Ely Cathedral, outside Cambridge …oh, the joy of ongoing creative excellence that Helaine gifts to the world! For me her work is a constant reminder of how to pursue the artistic passion of our gifs. Bravo, Helaine! And then, it is off to Dublin. I don’t know anyone in the city… I know some of its history and its poetry and plays and novels… and that could be said to give me a sense of its people and it gives my journey an excitement for the new and unexplored of all the places I have thus far been to. When I go to a city I have not been to before, my plan is to find a driver and car to acquaint me with the particulars of the city. I checked into my lovely hotel and requested said driver and car. And then made a quick addition to my request. I have a hearing problem… I have great what I call “vanity hearing aids” You cannot see them… but I know about accents… and I know about the Irish accent having tried it in a couple of O’Casey plays. It’s difficult and understanding it is more difficult. So I requested someone who doesn’t have a thick brogue. The next morning I came down to the desk and explained I was waiting for a driver to pick me up. “He’s here.” And up came Tony…with his lovely Irish lilt… totally understandable, “Sally! I’m Tony. Welcome to Dublin.” He plunks my cheeks with a kiss on each and I knew I would have a wonderful time with Tony in Dublin! There are so many wonderful aspects to Dublin and of the Irish. For me, their political situation was a big topic. They were one of two countries that stayed neutral during World War II. That for me, considering they made nice with the Nazis, was something I wanted to know about. And a very simplistic answer was that’s how much they disliked the British. And if you know the history, even a little bit, it could explain it, but does it justify it? The jury is still out on that. As the days dwindled down to a precious few, I was ready to go home. HOME… and the extra special benefit of flying from Dublin is that it is one of the few places that has American custom agents in Dublin so that when you check through customs in Dublin you are finished. Arrival at JFK meant just getting into my wheelchair and being rolled to a waiting car to take me home. Sooo, even with the gathering fatigue and aching joints and back, was it worth it??? New faces, old faces, new countries, old countries… wonderful. My friends, no matter what we say or do the years keep climbing… and our mission if we choose to accept it, is to learn to accommodate, adapt, and yes, slow down. It is difficult for me because somehow I equate slow down with death. The question somewhere inside not hidden too far away from my consciousness, WHAT IF…??? After a bad bout of the flu, a fractured spine, fear of flying became fear of dying. Little did I know how important planning and traveling was going to be to my ongoing life. And that’s the thing isn’t it? Until it isn’t … it is ongoing. Listen loud and clear… all you control freaks (even those who don’t think they are control freaks)… your due date is out of your control. And this is a good thing. I still have some shelf life left. Hooray! Try this to test for your own ability to plot and plan… put your right hand onto the inside wrist of your left hand. Can you feel it? You can??? Brilliant! I went to Fort Lauderdale for the winter. I left behind the bitter onslaught of this past season’s cruel rain, ice, snow, blizzardly winds that my friends, family and neighbors experienced. I escaped. But did I? I may have escaped the weather… but I didn’t escape life. If you want to skip my saga, and turn back to a good book or a good streaming on Netflix or Amazon or my personal favorite, Acorn TV, I shall not be insulted. I certainly wish I could have skipped it. Here’s the deal. I still got older. I still became more vulnerable. I still pretended I wasn’t older and more vulnerable. And when I wrote the blog about gratitude I missed the point completely. Let me explain! March was the compressed fracture of the third lumbar resulting from the cough. HACK! HACK! YOU BROKE YOUR BACK!!! Aw come on guys, enough is enough. These are supposed to be the golden years??? I’m afraid only in my fillings. I thought the gratitude I expressed for January and February was supposed to cover me for the year. Like the Brooklyn Dodgers of old – I wuz robbed! The lumbar episode of March challenged all notions of gratitude and for the most part, all my theories of “growing old”. As long as I thought I was doing what I always did… a few exceptions like dancing till dawn, drinking champagne from a satin heeled slipper (an orthopedic oxford doesn’t have the same look or feel), cutting my one woman show from an hour and a half to an hour (with relief some said that made the show better… what do they know? ), some dietary alterations (no lactose, no gluten, no fast foods, no fun) I thought to escape the label of “old lady”. And then came the Ides of March. Actually from the beginning of the month, the pain came. And some of you know that without any education, I am my own Doctor, I prescribed continuing pilates, massages, shiatsu all of the remedies that slowly but surely were making my back worse. Thank goodness for good friends who won’t put up with my complaining and called me on my medical education. “Where was it you got your degree?” One of my friends went so far as to find me a doctor nearby that was the doctor for the Miami City Ballet. It was high season in Florida. Getting an appointment was going to be at the very least, difficult, if not impossible. I checked out her website. I have a website, why wouldn’t she? It said she attended to dancers and performers. I called her office. And before I let her assistant get a word in, I announced I was a performer. “I’m a little older than most of the dancers and performers she works with, but I am still doing it… performing that is… and I need HELP!” And then, she asked me who the doctor was that referred me, and before I could stop it from coming out of my mouth, I dropped the name of the top orthopedic surgeon in New York City. I knew him slightly, but I never saw him professionally. I got the appointment. And I owe him. Well, within days of the appointment, after an x-ray which determined I had the compressed fracture and an MRI which showed it was recent (coming from the cough), I thought I would start treatment. Up to that point the pain prevented me from doing anything. But I was told NO! Two more weeks of doing nothing, giving the bone more time to heal and then I could begin a program of physical therapy. I had already been doing nothing since January. I have to tell you, I thought I could hear my mother and every teacher I ever had yelling, whispering in my earballs: “Look at her! Nothing! She is doing nothing!” Joan of Arc wasn’t the only one who heard voices. When I finally received the go ahead, I was like a kid that had won a prize. I emphasize kid because, like a kid I was off to the races. I was going to be the fastest healer this side and that side of the Mississippi… I did the therapy three times a week, I added some stretching and some massage on the other days and by the end of the first week… I was hurting again. The therapist sat me down. He said a nice thing first. Always start with the nice thing first. “You know you look younger than your age, right?” “Thank you,” I said. “On the outside you’re like a shiny tomato.” “Thank you,” I said. “Inside, you’re an octogenarian and your bones are mushy”. I laughed. But I did not thank him. And I love this one from the same essay: “You’re only as old as you think you are! Now you don’t honestly think having lived eighty-four years is a matter of opinion.” You don’t… Do you? For myself and fellow fossils, there is no such thing as doing nothing. If we have made it through to or any part of our seventies, eighties and ever onward it means we are doing more every minute of every day than ever we did at any other time in our life. AS THE DAMSEL OF OLD OR MAYBE AS AN OLD DAMSEL, I HAVE BEEN BESIEGED! We have read about it happening worldwide. People at home abed or lined up inside and outside hospitals with – I’m afraid if I say it will it come back and bite me again – THE FLU. I come from good peasant stock. In the home where I grew up, getting sick was not an option. Being one of eight, my mother did not allow it for two reasons: time and money. She didn’t have the time or the money to cater to any illness. Many is the time I remember being sent home from school with this or that ailment and my mother taking one look and sending me right back. And the tussle would begin. And if memory serves my mother won out more times than the school. This is all to say I had a healthy disrespect for being sick. Probably because I have been fortunate in avoiding the usual colds and flu until….. the end of December… All I can tell you, my friends, is that January is a complete blur. I think I was around for it. I just don’t have the specifics. And bugs and viruses (Are they twins or different species? Not sure.) have no respect for people… infants to seniors, rich and poor. In today’s world when it comes to infection we are one sneezing, coughing, fevered, unhappy family. If being part of the global family means sharing our bugs and illnesses, I am going to opt for hermithood. If it sounds like I am bitching…you got that right. Phew! Glad that’s done! Now let me get to the gratitude because it is that gratitude that began the healing process. I am firmly convinced that my bitchy attitude made the healing harder. Once I realized self-pity and the ever-present judgment and blame was ruling my consciousness, I surrendered. I think it is amazing that no one called me on my negativity. In recovery, all I got was support and love. I shall remember, my dear friends, that when a friend or loved one is not feeling well, give them the “ah-ha, oh, yes, I understand. It must feel terrible. Is there anything I can do for you.” And mean it. Because, in fact, that verbal caring goes a long way in recovery. Yes, my mother’s need for us to not be ill was based on time and money. Time is certainly a factor in getting well. It took me over a month and I am still working on it. And I am not negating money. No, it is essential to recovery. But it isn’t the ultimate. I would like to share with all those “billionaires” who think that by buying votes they can buy their health. I am here to tell you that can only happen if it comes wrapped in LOVE. To all my friends and family, Thank You for your time and money, but mostly thank you for healing me with your love and kindnesses which cannot be bought.